"We gladly receive the light as a sign of our willingness to be channels of peace, by our words and actions.."
"2019 Provisional Dates - Austrian Distribution Service Sat 14th Dec - venue to be confirmed..."
"...therefore UK Distribution should begin Sun 15th Dec again to be confirmed"
In its 32nd year, the Peace Light from Bethlehem campaign was originally organised by the Austrian Broadcasting Company - ORF (Linz) - and was part of a large charitable relief mission - Light into Darkness, for children in need in Austria and abroad. Since 1986 there has been a great deal of co-operation between Scouts and Guides in many countries which has allowed the light to travel throughout Europe, such that the light is passed on to 30 European Countries and for the past few years, on to North America, Mexico and Canada . Each year, a child from Upper Austria kindles a flame from the "Eternal Flame" from the Nativity Grotto in Bethlehem where Jesus was born. 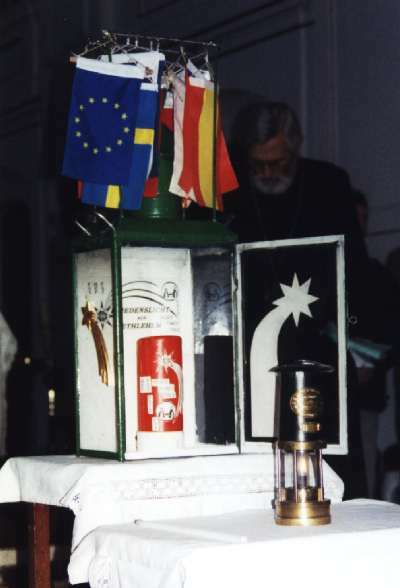 The light is then flown to Austria from where it is distributed at a Service of Dedication to delegations from across Europe who take it back, with a message of Peace, to their own countries for use at ecumenical services throughout the Continent. Scouts and Guides can then take the light on to other churches, hospitals, old people homes, prisons, and places of public, cultural and political importance - to anybody that appreciates the significance of the "gift". In past years the light has been presented to Pope John Paul II, Pope Benedict XVI, Pope Francis, Mikhail Gorbatshow, the former King Hussain of Jordan, EU President Romano Prodi and other member of the European parliament in Strazbourg, the UN Troops in Kosovo and continues to be taken to Ground Zero, New York. Jelly Babies were launched in 1918 in Sheffield, UK as "Peace Babies" to mark the end of World War I. Production was suspended during World War II due to wartime shortages and the fact that the name had largely become ironic. In 1953 the product was relaunched as "Jelly Babies". So why not as a "sign of peace" offer a "Peace Baby" when passing the Peace Light on.